Laminated Bumpers are more than just a smart investment. These types of protective bumpers are required by the US Occupational Health and Safety Administration (OSHA). Laminated Bumpers feature a durable and extremely resilient construction designed to absorb and minimize routine impact between delivery vehicles and loading dock doors. Use our Laminated Dock Bumpers to prevent collision-related damage when trailers approach your facility, manufactured with commercial-grade rubber-cord and supported by 3/4” rods throughout. Manufactured with a resilient rubber-cord material that is reinforced by support rods, our Laminated Bumpers are industrial-strength solution that provides maximum shock absorption and protection. 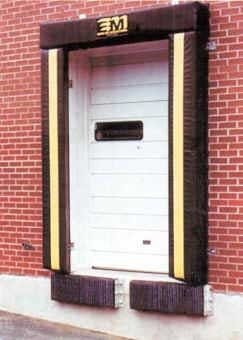 Protect facility loading docks, delivery vehicles, and personnel with these bumpers. LOK-BOLTS "L", "R", "T" are designed exclusively for use with our style L, R, and T bumpers. Firmly anchor bumpers into place. Note: These Lok-Bolts are laminated. "J" BOLTS "L", "R", "T” are designed to anchor L, R, and T style bumpers into concrete surfaces. Also appropriate for a variety of other commercial applications. Note: These bolts are laminated.